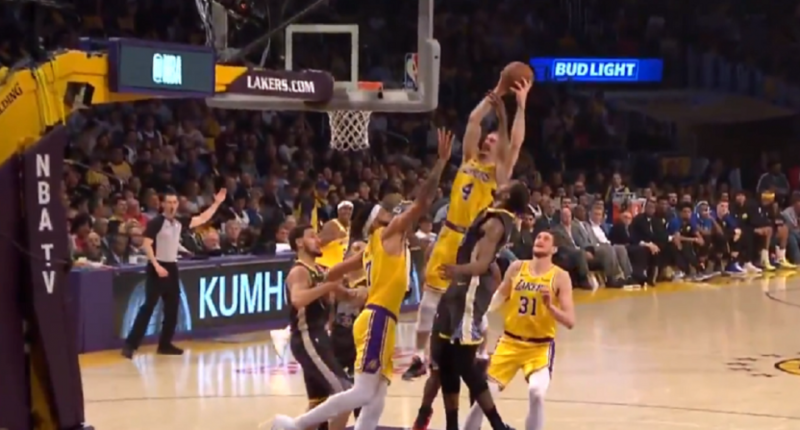 The Los Angeles Lakers’ Alex Caruso probably even surprised himself with a dunk he had in Thursday night’s game against the Golden State Warriors. The 6’5″ guard celebrated his first start of the season by throwing down an unbelievable putback dunk on a Rajon Rondo missed shot. Caruso came out of nowhere for the jam which stunned teammate LeBron James on the bench. It also featured an amazing call from the great Kevin Harlan. The rest of the night — just like the rest of the season — didn’t go so well for the Lakers in a 108-90 loss to the Warriors.